I have been reading about bonding issues with epoxy and white oak. I seen it mentioned but never explained. I am planning on using white oak so I would like to what the issue is and how to prevent or alleviate it. If it is to insidious or difficult I may consider using mahogany instead. Thanks for all your help. I've been reading some of the other posts and answers and been gaining a lot of knowledge. Re: Epoxy bonding issues with white oak. I will stick my nose into this question. There is a lot of hearsay regarding this issue and opinions will vary. 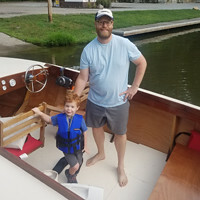 I built a ZIP with white oak for all framing, transom, and deck cover boards. I used Titebond III to glue my half lap frame joints and the two horizontal slabs of 8:4 white oak that make up the transom. Five years later all is well. Scuff the surfaces to be joined with 120 or so sandpaper. White Oak is not particularly oily so wiping down with acetone is likely not necessary but won't hurt. White oak is also has quite dense grain. The following are excerpts from a July/August issue of Fine Homebulding Magazine which did a scientific study of different glues on different woods. all costs, don’t hope that polyurethane will fill a loose ipé joint—it won’t." on tight joints than on snug ones, and the same was true with five out of six glues on maple. If oak and maple are representative of domestic woods, you don’t need to worry about a tight fit causing glue starvation. Of course, these “tight” joints are far less tight than a clamped joint. On ipé, and perhaps other dense tropical woods, leaving a little extra room for the glue seems like a good idea. That said, both PVA glues and epoxy create incredibly strong joints whether the joints are tight or snug." Based on the average strength of all the joints, liquid hide glue beat out hot hide glue. However, if you look at specific joints and woods, hot hide glue was strongest in five of the nine categories. I had expected liquid hide glue to be weaker due to the addition of urea to keep it workable at room temperature, but in this test the two glue types were about equal. Where hot hide glue was comparatively weakest was on snug and loose ipé joints." white oak is so dense, the epoxy doesnt soak in very deep, it mostly just lay on top of the grain. Cypress is just the opposite, it will soak up epoxy like a sponge does water. Also, white oak swells the most of any wood if it gets wet, this swelling or, movement, tries to move while the epoxy glue line is perfectly stable, thus it adds up to a shearing moment along the glue line. I have worked with white oak, ash, spanish cedar, western red cedar, mahogany, sapele, cypress, pine, walnut, and a few others. I have had 2 epoxy failures on my build, both involved oak. With so many good woods to choose from, oak is over rated. The short answer is sand with 80 grit, thoroughly wipe with 70% alcohol with water, and lightly clamp. The Gougeon Brothers at West Systems do a lot of research. They tested white oak samples using different joint prep methods. I couldn't find the that study. They published a few other articles, www.epoxyworks.com/index.php/so-stands-the-mighty-oak/ www.epoxyworks.com/index.php/white-oak-redux/ and http://epoxyworks.com/index.php/letters ... white-oak/ and if you really want to go into the weeds http://www.westsystem.com/wp-content/up ... 1205-1.pdf is a 400 page free download of their book on boatbuilding with epoxy. gdcarpenter wrote: I used Titebond III to glue my half lap frame joints and the two horizontal slabs of 8:4 white oak that make up the transom. Five years later all is well. A few posters have brought up an issue that has made me curious. Did you screw your sheer clamps or chines into that portion of your frame that is the half lap, specifically lengthwise into the joint itself? There seems to be concern that screwing into the joint may cause it to fail. Have you had any difficulties in this regard? The only difficulty I have had screwing into epoxy joints is my drill bit will almost always wander to the side of the joint rather than through the epoxy, and I am guessing that is because the epoxy is much harder that the surrounding material. You? I'm in the Glued and Screwed/Nailed team. But, to my knowledge we have never had a boat fall apart! I used white oak for my frames and while I was making them and I often used the off cuts to to glue up some test joints. I broke the test pieces by placing them on bricks and hitting the joint with a mini sledge hammer. The test pieces never broke at the joints which gave me some confidence in the strength of the bond. I followed the epoxy manufacturers instructions which included applying the epoxy to both surfaces of the joint before adding any thickeners to the epoxy. I would then mix in some silica additive to thicken the epoxy and apply this to both mating surfaces over top of the previous application prior to assembling the frames. The plans from Glen L also called for quite a few fasteners to be used at all these joints. The instructions in the plans said that theoretically the glued joint was strong enough that the fasteners were not required for the strength, but were extra insurance of a strong joint. The plans also said the the specified fasteners used per the plans made the joint strong enough on there own also. The epoxy has the added benefit of keeping moisture out of the joints making them water proof. Basically what the plans were saying was that the joints were twice as strong as they needed to be as they had both epoxy and fasteners. This fasteners provide some safety margin should any of the glued joints be less that perfect for some reason. The fasteners also allow you to build and assemble the frames dry to the correct alignment. Then the frames are disassembled, glue applied, and reassembled with the fasteners which act as as locators and clamps. I would say that if your plans call for ample fasteners, then this reduces the concerns with the glued joint. I made the best glued joints using the white oak that I could. The fasteners provided extra insurance of a strong joint. I have just started a new build and have been deciding "what wood". In my piece of Eastern Ontario I can get locally milled, kiln dried White Oak for less then half the price per board foot of African Mahogany (which I have used in the past and will be used on all "visible" parts of my new build) and for even a couple bucks less a BF then Douglas Fir (which I used for frames on my 25'ish footer and was well pleased). I am also a fan of West System techniques for building - have their book and have read it dozens of times. And because of them I have talked myself out of using white oak. They don't recommend it for some of the reasons posted in the tech notes that have been linked earlier in this thread. They also don't see the need for fasteners if you follow their technique (which may have some bearing on their not recommending white oak). While I absolutely believe their claims that you can build a boat "without fasteners", I do not trust my ability enough to forego them. I feel I can use a few less than building instructions suggest - I have "some" experience and feel confident enough in my gluing ability, but not 100%. But wanting my construction to have maximum strength/durability for material used, if there is even a slight question about the durability of a bond using White Oak, for the 70 extra dollars it would cost to use Douglas Fir for the 35 board feet of frame material, or even an extra $170 if I chose to go with mahogany throughout, I reasoned that is a pretty small price in the overall scheme of things to have one less worry. Before I hang the motor on the back I will probably be $5K into the build plus somewhat over 100 hours of my time. Compared to that what's a couple hundred bucks? I have 0 concerns about any of the white oak glue joints in my boat. Of course it's not finished and never been used. There aren't a lot of oak to oak joints anyways. Mostly we're talking plywood to oak except for maybe some laminated longitudinals. Any test joints have broken in the wood. Any test joints with oak to plywood have broken in the plywood. If you're concerned about it test it yourself. Or use a different wood. Everything is backed up with screws and boat nails too. Thanks everyone. I'm going think hard about the white oak. I may go to mahogany. Also easier on planer blades. Sapelli was the same price as oak at my supplier in Marion, NC. I did not know this until after I had already bought all the oak. I might have gone that way had I known. I just assumed it was quite a bit more.